Ash betrayed his love’s greatest secret to save her life. Now Sheela is in the hands of Duke Schaever, and his every attempt to save her has failed. At least she is still alive. Even if the most dangerous man in England has her in his grasp. In a last ditch rescue effort, Ash agrees to complete another task for the Misters. This task is more dangerous than all the others, including stealing a magical item from a vault guarded by a dragon. He must steal away the Duke’s betrothed, adding kidnapping to his already long list of sins. Ash will do anything to liberate Sheela and win her forgiveness for sharing her secret. But the Duke’s fiancee may not be entirely human. Not anymore. The Duke’s engineering of metal and magic has created more abominations than even Ash could have known. And all of them turn their wrath upon Ash to protect Schaever’s intended. How many more debts will Ash incur to rescue his love? And does Sheela even want to be saved? 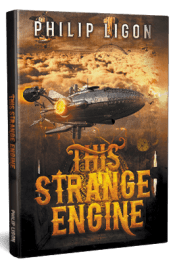 The Engine Series continues in this action-packed fantasy sequel, delving into the Duke’s horrific experiments and launching Ash into ever deeper trouble. 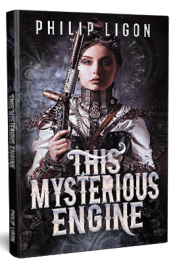 Steampunk creations come to the forefront as he realizes just how driven his enemy can be. Dark Fantasy and Alternate History fans alike will devour this twisted tale of love, control, and addiction. What does it mean to live? And what does it mean to die? By the end of this job, even Ash won’t know. Discover the Duke’s twisted merging of science and magic today. Read This Mysterious Engine now!